The Questing Heirs Genealogical Society welcomes you to our blog. We post articles that describe research sources for anyone whose ancestors may have passed through or settled in Long Beach, California, and feature news and notes about our Society’s activities both past and present. 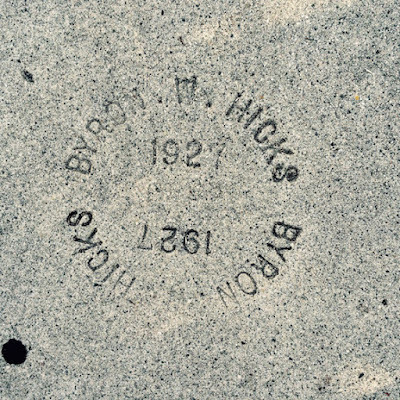 Long Beach’s sidewalks contain impressed “signatures” of many pavers who plied their trade in the city. If your ancestor owned a construction company or worked for one of those cement contractors, our “Sidewalk Signatures” series will be of interest to you. Byron Wallace Hicks was the son of William Soloman Hicks (born January 1, 1833 in Bodmin, Cornwall, England) and Rosetta Tear (born October 16, 1839, in LeRoy, Ohio). Byron was born September 20, 1877, in Warren, Illinois, and he married Gertrude L. Copeland in Vulcan, Michigan, on November 1, 1904. He graduated from the University of Illinois at Urbana-Champaign, with a B.S. on Civil Engineering and was a contractor for waterworks, railways, and highways in the Midwest for many years. Byron and Gertrude came to Long Beach in the 1920s with their children, and he continued his contracting profession here. The 1928 Long Beach City Directory lists them like this: “Hicks Byron W (Gertrude L) cement contr h 2364 Atlantic av.” In the 1930 census we find Byron widowed, living with his daughter Lucy. He is described as a “contractor street paving.” Byron W. Hicks was married again in 1933 to Alma M. Brister. He died in Long Beach on June 6, 1947. Clues in his obituaries reveal that he was a Mason (he had a Masonic funeral service) and that he probably attended St. Luke’s Episcopal church in Long Beach (the officiating pastor at his funeral was the Rev. Perry G. M. Austin, D. D., who was rector at St. Luke’s during the 1930s and 1940s). He is buried in Elmwood Cemetery, Warren, Illinois. RESEARCH NOTE: Sources for this sketch: Ancestry.com; FamilySearch.org; LBPL; The Alumni Record of the University of Illinois 1913, University of Illinois, Urbana-Champaign © 1913; Long Beach Independent, Long Beach, California, 8 June 1947; Santa Ana Register, Santa Ana, California, 14 November 1933; Journal-Standard, Freeport, Illinois, 13 June 1947.